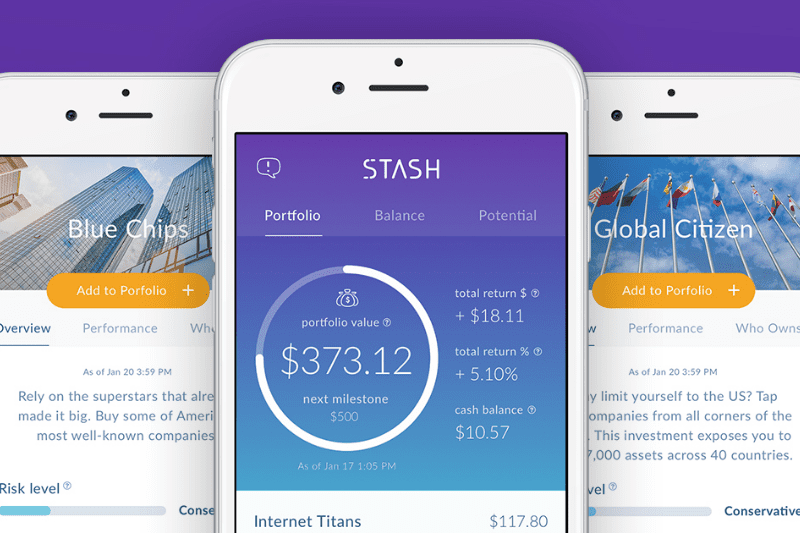 Stash is an investing app that is aimed at beginner investors. Users can buy fractional shares of exchange-traded funds [ETFs] and individual stocks, starting with as little as a $5 investment. Stash is a popular investing app that is aimed at beginner investors. Users can buy fractional shares of exchange-traded funds [ETFs] and individual stocks, starting with as little as a $5 investment. Stash doesn’t manage these investment accounts directly, but rather helps guide investors through the process of building a portfolio of stocks and ETFs and watching it grow. Based on The Money Manual’s Stash Invest review this is a fintech app its best: easy to sign-up for, easy to use, and on top of it all: it makes investing fun and educational. Investment options: Stash offers over 40 ETFs and 65 individual stocks for its users to invest in. Stash allows its users to hold fractional shares (a split of a single share of a stock or ETF) between several investors on the platform, a big differentiator between its offering and that of other brokerages. Customer support: Stash offers its users both phone and email support. Phone support is available Monday through Friday, 8:30 a.m. to 6:30 p.m. EST, and Saturday through Sunday, 11 a.m. to 5 p.m. EST. SIPC Protection: Stash covers its users investments with Securities Investor Protection Corporation (SIPC). Security: The app is registered with the Securities Exchange Commission (SEC) and is a Registered Investment Adviser. As far as securing its user’s private information, the app uses 256-bit bank-grade encryption and secure sockets layer (SSL). Also of note, it does not store its users’ bank login information. Auto Stash: This feature allows Stash users to set scheduled times to invest in their Stash Invest account. Stash Retire: Beyond brokerage accounts, Stash is now offering Roth IRA accounts with a minimum account balance of just $15. Smart-Save: This feature analyzes when you users have cash to spare, and then puts away a small percentage of it. Users can adjust their saving rate, and withdraw what they’ve saved at any time. Users earn interest on what they save or can choose to invest it. Custodial Accounts: Users can open a Stash account on behalf of someone under 18. This is the perfect way for parents to begin teaching their children about the power of investing early. Stash Coach: This feature is designed to help users grow their portfolios and involves investing challenges depending on a users risk tolerance and ways for users to earn points. How Much Does Stash Charge? Stash accounts have a very low $5 minimum account balance. To put that in perspective, many Fidelity brokerage accounts require a $2,500 minimum. The app charges $1 a month for account balances under $5,000, $2 per month for retirement accounts under $5,000, and a 0.25% annual fee for accounts with $5,000 or more. It’s important to note that fees are deducted out of a users linked checking account, and are not taken from their Stash balance. Fees are waived on retirement accounts for people under 25 and also of note, Stash is free for a users first month as a promotional offer. There’s also no annual, inactivity or outgoing transfer fee. Helping beginner investors: Stash really shines when it comes to helping beginner investors. It takes just a few minutes and a few easy questions to begin investing with Stash, and the app is great at making investment suggestions, while offering an investment education via its “learn” tab for newbie investors. Picking investments for users: Navigating investment choices is generally speaking not easy, but Stash breaks it down for users, helping people pick which investments should serve as the bulk of their investment portfolio, and which investments a user should allocate less of their funds to. Via the Stash Coach feature, the app will alert users if their portfolio isn’t diversified enough. Stash does a great job of breaking down the ETFs and individual stocks it offers to investors, too. Click on an investment within the app, and it will bring users to a window to see the investment’s level of risk, its ticker symbol, last price, and for ETFs, the expense ratio. For ETFs the app also breaks down its investment’s holdings. Click on a second tab and users have access to even more information on the stock or ETFs performance. While it provides a lot of information, it’s easily digestible. Giving entry to smaller investors: While many brokerage accounts require minimum account balances in the thousands, investors can get started with Stash for as little as $5. That gives entry to investing to just about anyone who wants to try their hand at it. The app goes further for smaller investors by allowing people to buy fractional shares of ETFs and stocks. For instance, take Amazon, which has a stock price hovering at just under $2,000 a share (as of September 2018). With Stash users can buy a piece of the pie with just $5. Within I Believe, investments are mission driven ETFs including those focused on clean energy and those focused on socially responsible companies. In the I Like category investors can choose companies that align with their hobbies and interests including the “Enjoy Yourself” ETF which focuses on travel companies. Goal setting: Stash has two important features that allow its users to better reach their financial goals. It has a tool that allows users to invest additional money on a schedule which they can easily adjust based on the anticipated return of their investments. It also offers a Smart-Save feature which works in the background to monitor a user’s checking account balance, automatically moving cash into a user’s Stash account. Users under 25: For younger users, Stash has some great benefits. Parents are able to open custodial accounts for users under 18. And for users over 18 but under 25, they are able to open free retirement accounts. Fees as a percentage of investment are slightly higher for Stash than other products on the market, though based on our analysis at The Money Manual we still believe that Stash’s low minimum balances more than make up for this. Another area where Stash arguably falls short is that it isn’t actively involved in managing its users portfolios in the way that a robo-advisor would. That being said, the app’s educational resources, and easy to understand investment breakdowns largely make up for this. The app also provides investment ideas based on the risk profile users provide. One thing to be aware of, though not so much a negative, but rather as a piece of the fine print to be aware of, is that the app asks users to commit to regularly contributing a certain amount to Stash during the sign-up process. This is something users can easily opt of. Is This The Best Investment App For You? For people under 25, there are few better apps out there to start testing the waters and learning how to invest. Thanks to fee free retirement accounts for those in this age range, Stash is a no brainer. For those over the age of 25, who are wanting to dip their toes into investing for the first time, this is a strong tool that we wholly recommend for a few reasons: you can start with very little capital, the app does a great job of breaking down investment options and offering educational tools, and generally, it’s a fun app to use. For parents who want to give their teens a tool for starting to learn how to invest, this is a great option as well. Stash is incredibly easy to get started with, all in users are looking at ten minutes to sign-up. Users start by supplying their email and password, name, date of birth, phone number, and a four digit security passcode. Then Stash will ask what kind of investor they imagine themselves being—conservative, moderate or aggressive. That is followed by a few simple questions like what their employment status is, what type of work they do, how much income they earn, their approximate net worth, when they think they’ll use the money they’re investing, their marital status, if they have kids, own a home, their level of investing experience, if they have a retirement account, and if they have student loans. It seems like a lot, but most people can sail through these questions within a matter of minutes. From there users decide how much they would like to invest each week. Users can also choose to make a one time investment. Then users start to choose their investment mix–choosing between Stash’s offerings of stocks and ETFs. From there, users are asked to link their bank account to pull the initial and the fees from. That’s it: a user is signed up. Executing trades takes a little bit longer, around 24 hours was how long it took when The Money Manual tested it. Investing can be intimidating, but Stash is specifically designed to make things easier for novice investors, and it succeeds. Beyond that, it manages to make investing fun, by creating ways for people to invest specifically in their interests, and education around investing. Sign-up for Stash and get a free month for free!